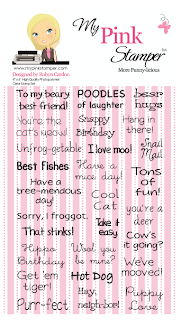 Welcome to the June edition of the My Pink Stamper Pinkalicious Blog Hop!! 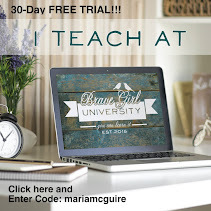 If you arrived from Heather's Blog you are on the right track. Heather is our Guest Hopper this month and she is incredible talented. We are lucky to have her! You can see her work every week on the Bitten By The Bug 2 team--she is our leader and I'm honored to be part of that team too!!! Our challenge this month is SUMMER!!! It can be any type of project as long as it has to do with summer related activities. 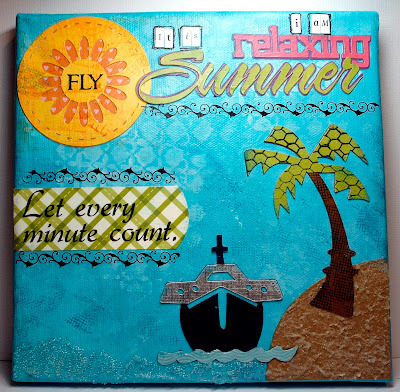 I decided to do a 8" x 8" canvas to put on my kitchen counter to remind me to "chill out" a little--it is summer. Next up you will be hopping to our last stop this month--Wendy!!! After you finish the hop, please go back to Robyn (My Pink Stamper's) site to play along in the challenge with us. Want to win a set of my Pink Stamper stamps? Just leave a comment below and let me know what your favorite thing to do in the summer is and you will be eligible to win the set. You have until Sunday night (June 12th) at midnight Central time to leave a comment. I will pick a winner with random.org the week of June 20th. 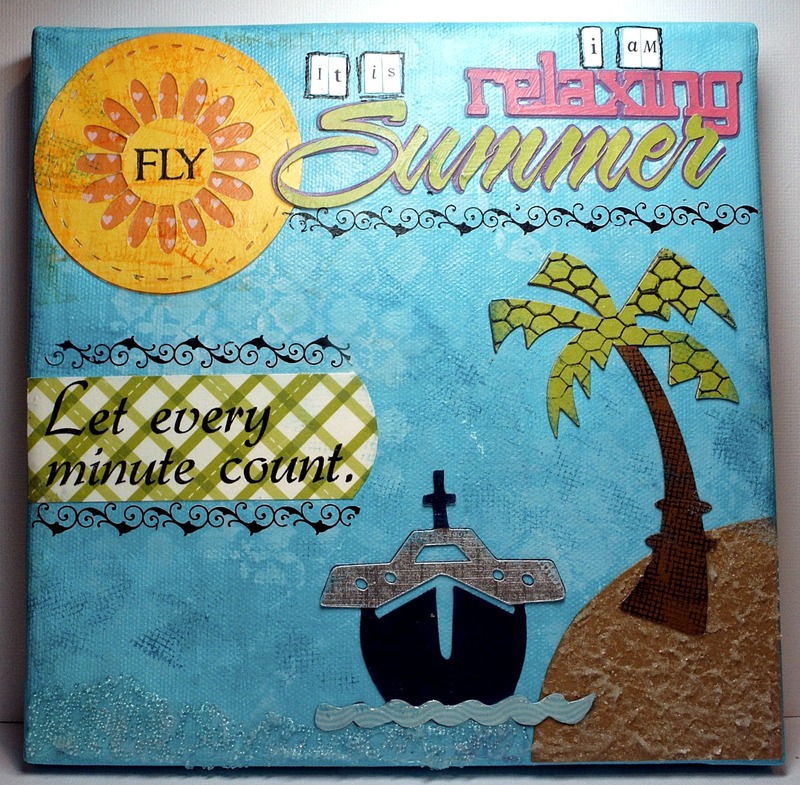 Creative Memories Cheerful Seasons = Relaxing Summer @ 1.12", "sun" shape @ 2.88"
Summer Vacation = palm tree @ 4.06", cruise ship @ 2.65"
Create A Critter = Clouds @ 1.24" and 1.71"
Great job on this canvas - love all the textures! Your project is awesome, a beautiful piece of art. Thank you for sharing...I'm a new follower. Love your canvas. My favorite thing to do in the summer is sit out back and watch my koi in our pond. Thanks for the hop and giveaway! MY GOODNESS your project is OOOOBER FANTASTIC!!!! I love sitting on the deck on cool summer nights watching the lightning bugs fly around, but where I live now I don't see them very much at all. When I can't do that, then I love to eat watermelon, its a great treat, and its not bad for you either! Oh wow this is darling. Love the sand and the water. Would love to see a video of how you did that. I love your canvas! It turned out great! My favorite thing to do in the summer is to take my family to the waterpark in town. My youngest and I just float down the lazy river the whole time. It's very relaxing. Thanks for the inspiration! This is my first hop, and I'm loving it! Thanks for the chance to win. My favorite thing to do in the summer is to go to the water park that is at the end of the street with our son and all his friends! That's really nice, and should remind you to relax and enjoy! Hope it works for you. 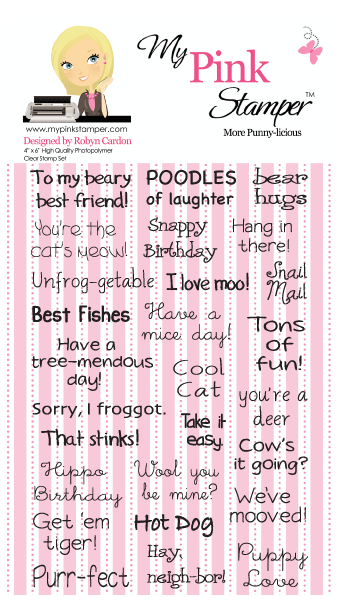 And for the chance to win a set of Robyn's stamps! !--Pat N.
Love the canvas. I am a new follower. Great layout The colors really pop. TFS and for the opportunity to win some blog candy. just great. love it. very nice. Love the canvas! My favorite thing to do in the summer is read! There is nothing more relaxing. What a neat project, I love all the different textures!! I love to play outside and enjoy the weather with our boys (when its not too hot! ), the evenings are the best - when we can all relax outside as its cooling off! I love your canvas Maria! It screams SUMMER TIME and I think we could all use this message in our kitchen (at least I know I do)! Our favorite things to do in the summer are hang poolside, go to the lake, camp all while spending time with family! I appreciate all the work you and the ladies put into this hop each month! Another fun month of fun projects! Thank you! Love the layout, very creative. I would have to say my favorite thing to do is Cookout with family, read and craft! Love the canvas! Definitely screams summer! :) My favorite thing to do during the summer is hang out with my little boy! 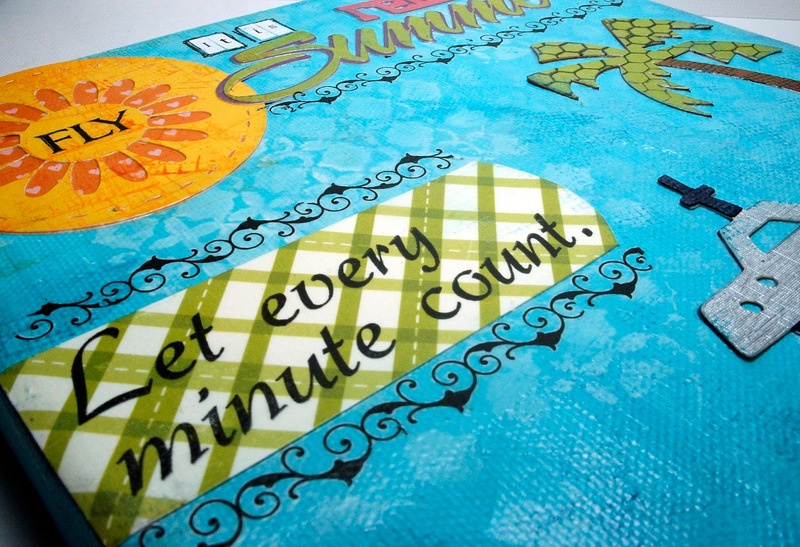 What a great project - and an AWESOME way to remember to relax while it's summer!!! My favorite thing to do in the summer is GET OUTDOORS!!! Thanks for a chance to win!!! My favorite thing to do in the summer is have cook outs with all the kids and grandkids! Love your project!! My favorite thing to do during summer time is goin to the beach. Relaxing tropical lo. Spending time with my family during the summer without school is my favorite thing. I love the idea of making a visual cue to remind yourself to enjoy life! It turned out really nice. Now my mind's wheels are spinning with ideas. Thanks for the inspiration and the opportunity to win a set of fabulous stamps. Love your project! TFS! I have to say my favorite things about summer are spending outdoor time with my family and friends, popsicles and pool time ;), and the warmth all around us! My favorite thing to do in the summer is going to the river with friends. Thanks for the chance to win! Wow....totally AWESOME! My fav thing to do in the summer is bar-b-que with family and friends. Great job on the canvas. Summer time means grilling and hanging out in the backyard shade. I love scrapbooking and crafting with my 7 year old daughter. This year she's learning to sew....this will be interesting! Fun "girl" time is the best. What a great project! Thanks for a chance to win. I love to go to the beach in the summer. Since I live in CA I actually go almost year round! Love the idea of the canvas! I'm going to try one for the first time! I like all the pattern paper you picked for your project. My favorite thing to do in the summer is to go to the beach with my family. Let's see, I would say going for a nice relaxing bike ride is one of my favorite summer activies. I loved your project!! My favorite thing to do in the summer is to go to the lake with family and friends!! Thanks for the chance to win!! Love to chill in the summer. Vacations and BBQs are fun to go to during the summer! Beautiful canvas. Great idea! THis summer is special. I am taking off every Friday to do some beach time with the kids! Our first beach visit was yesterday. (I don't like the beach at all, but my son needs the ocean for his eczema). We are only 6 miles from the coast, so it is just a short car ride down the boulevard! My favorite thing to do is play at the playground with my daughter. Thanks for such a great giveaway. What a great project! I love all the details. I hope when you see it, that is does remind you to relax! My favorite things to do during the summer is spend more time with my kids and sleep in since I'm off all summer. Also, it's a great time for me to get some extra crafting time in! YAY! Great project. My favorite thing in the summer is the visit from my oldest son, he comes for 2 weeks from Florida. I love your canvas! My favorite thing to do in the summer is to go camping at the beach with my family. I love to dig in the sand and make sand castles with my boys. Beautiful home decor project! I love how yours turned out!! My favorite thing to do during the summer is just spending time with family, especially around the pool with the bbq pit going. I never thought about using a canvas! That is a good idea. I teach, so in the summer I like to be lazy and watch all the t.v. I couldn't watch. I would love to go to the beach this summer & just relax. Awesome LO. Love the water. Wow great job!! I would love to give this a try!! Hands down my favorite summertime activity is relaxing on the beach!! Thank goodness I live in Florida!! TFS!! Maria I love it! I love that you made a project to put in your kitchen. Fabulous as always! :) I've enjoyed working with you on the MPS DT, hopefully we can continue in the future! great job on your project. i love getting together with friends and neighbors for BBQ's in the summer. This is beautiful. Bright and summery. I love going to the beach and spending time with my family and friends. What a cute project! Love the colors you used. I love to take a book to the beach and just relax and read all day. Something about the waves that just relaxes me. Very fun canvas! Feels like summer looking at it. Our favorite thing to do in the summer is camping on the weekends. I am afraid with all the flooding here along the Missouri we won't be doing much of that this summer. Thanks for the chance to win. Super cute!! I'm loving the texture and color choices!! Favorite summer stuff - zoo and swimming with my little guy! I loved your work on canvas! I did a canvas piece too of one of my grandchildren at the beach. Is yours going in a scrapbook or on your wall? Mine's on the wall. Our favorite thing to do during the summer is take our grandchildren out on the lake and teach them to ski and wakeboard. In fact, that's where they are right now! TFS. I'd love more info on how you put this together... a video maybe? My favorite thing to do in the summer is hang out by the pool and just relax. Awesome project! My fav thing to do in the summer is be lazy!!!!! I like to lay around and read a book and just relax! I love to lay in my hammock in the evening and read if its not too hot or too many mosquitoes! Tx summers can be somewhat brutal and I'm not a big fan of water. Your canvas is fantastic, so full of color! I love going to the lake in the summer!! 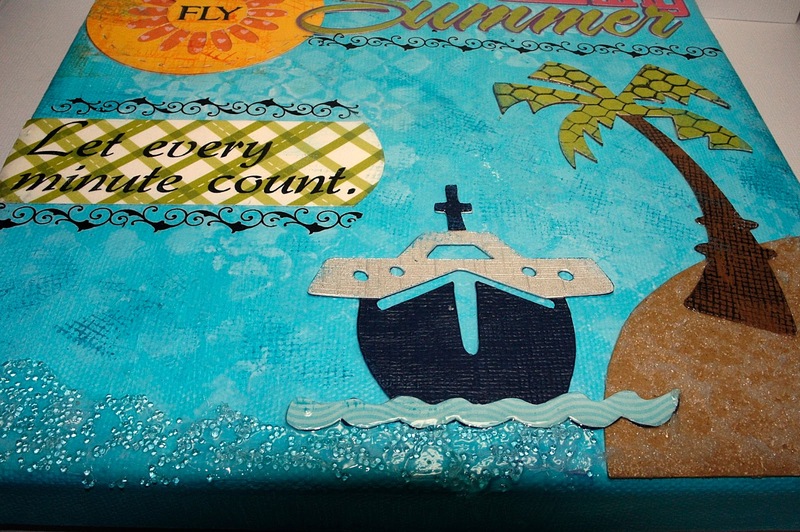 Is this a scrapbook cruise I want to come!! Beautiful.. and the Canvas Cool! Love the canvas! Favorite summer fun thing to do is swimming and grilling out! Very nice canvas! We love to go camping and swim in our pool! Thanks for the chance at a great giveaway! I love the canvas and how you made the water "sparkly". :) My favorite thing about summer is being outside with my kids so we can enjoy the sunshine!! I love that school is out and can spend time with my kids swimming and eating popsicles. Cute canvas! I love it! My fave thing in the summer is just being warm! I live in a cold area and it's nice to not have to have the heat on for a few months!!! 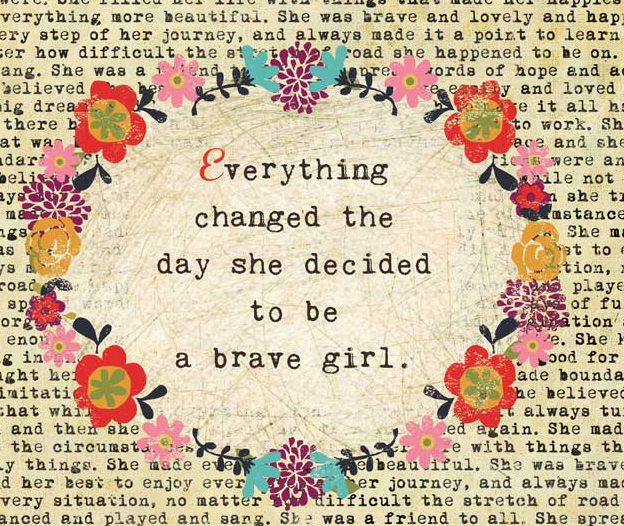 This is so beautiful, and definitely a reminder that all we busy moms need! Love this!! Such a great idea!! My favourite thing to do in the summer is just relax on the patio with friends and family. Thanks for the chance to win!! Beautiful canvas!!! That's going to look great in your kitchen! I need to remember that its summer too sometimes and we don't always have to be running around trying to fit everything in!! My favorite thing to do in the summer is grill! We love doing it and it usually brings the entire family together! We try to do it once a week! Thanks for sharing and thanks for the chance to win!! Love your project! My favorite thing to do in the summer is craft. I am a teacher and I have off all summer so I love having the extra time to create some fabulous projects! In the summer I love to attend outdoor concerts in the park. Love the canvas! I need one of those! When I have the time I would like to just layout side and read a book and get a tan. Love this project! The details are gorgeous and I just love all the patterns and textures. So beautiful! My favorite summer activity is attending outdoor highland dance competitions. :o) Thank you very much for the opportunity to win that wonderful stamp set! Great job on your project. In the summer I love reading a good book by the beach or pool...it helps me relax. Nice project. I love spending time with the kids creating crafts for our 4th of July/Family Reunion. Last year we made candy necklaces and decorated t-shirts and flip flops. I look forward to their creativity that sparks every year. What a creative and fun project! Such wonderful colors and sentiments. Thanks for sharing and the chance to win. My favorite thing to do in the summer is swim. Such a cool project!! I actually work pretty much the whole summer except two weeks were i am almost kid free(i have a home daycare, i also have a 3 year old and i wouldn't want to be totally kid free) On our holidays i spent as much time with my daughter going out of town to different attractions(this year Niagra Falls) Thanks for the chance to win!! I love it! Just a great project. I love the summer, it's the time I'm off of work and can actually spend some time working in my craft room. Cute project. I love it. My favorite part of summer is lazing on the deck on the weekend, drinking cocoa and reading my book each morning. Oh, and the BBQs. Love that as well. As soon as I saw your project a big smile came across my face! Love it! Thank you for sharing. This blog is always so fun! I can't wait for next month. What a cute idea! I always love your projects, you do amazing work, thanks for sharing your talent with us, and for the giveaway! I've never made a canvas before - that is so cool!! In the summer, I like to find little moments to scrap in amongst all the Little Leagues games! 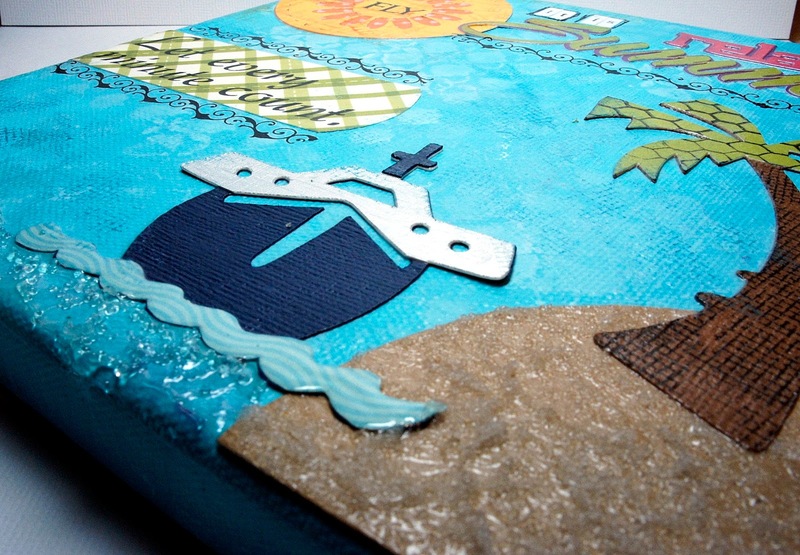 I love your canvas - wonderful idea! In the summer I love to sit on the patio, look at my garden, and read! Really cute project I love all the colors. Cute!! I love this!! Very creative!! Such a creative page! I will definitely use this idea! Thank you for the giveaway too! Very creative layout absolutely love it! I love summer time for BBQ'S. i just love what you did with the canvas...very nice and creative....love all the colors! Love the canvas, the design is wonderful. What I enjoy about summer a house with ac...lol I am kidding I enjoy spending time with my family I get to see them more this time of year. what a great reminder piece... I have just started doing some canvas projects ~ they are alot of fun! I enjoy boating in the summer ~ its our family time! maria, wow!!!!!!!!!!!!! this is an incredible layout. i am enjoying every detail tfs! I love your project it looks great. In the summer I love to go hiking and horseback riding in the rocky mountains.